I believe that babies should be celebrated. 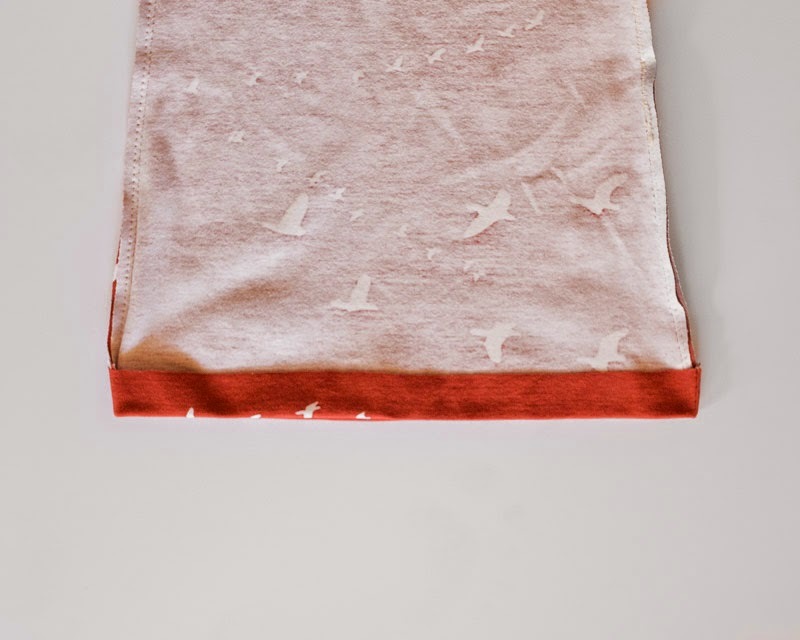 So I created this pattern to help you celebrate your baby - or your friends' babies - with a newborn gown! This pattern is intended to fit an 8 lb newborn, with room to grow. When drafting the pattern, it was my intention that the gown could be worn for the first three months or so, through those groggy, multiple, middle of the night diaper changes. Therefore it will likely be large on a true newborn. the PDF pattern HERE. When printing the pattern make sure your page size is set to 'Letter' and that 'Fit to Page' is NOT checked. 1 yard of medium weight knit (stretchy, t-shirt like) fabric - PREWASH!!! You will need to cut several binding strips. Be sure to cut them in the direction of the stretch. Ribbing is a great choice for neckbands. But I often like to use the same knit as my main fabric. 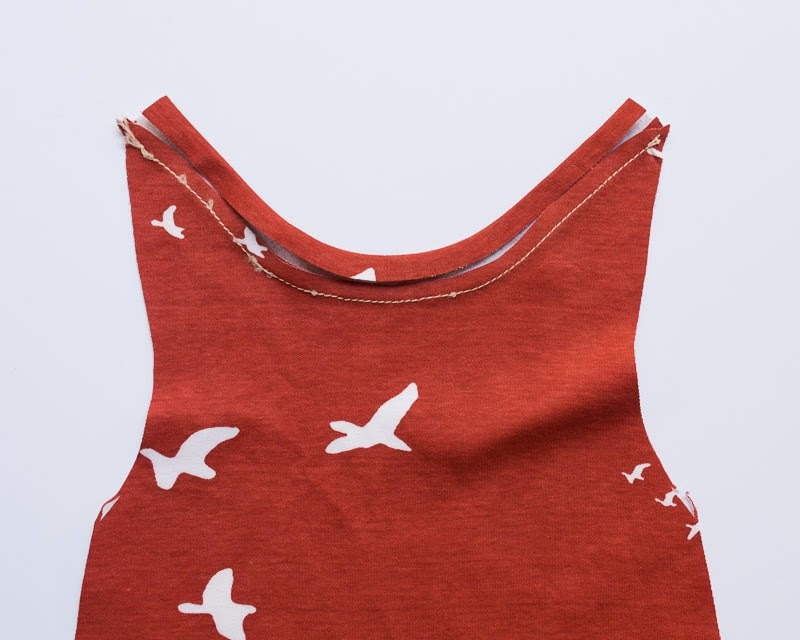 If you'd like more info on cutting binding strips for knits, check out this post. Or you can hem the sleeves. Be sure to prewash and machine dry your knit fabric before use. 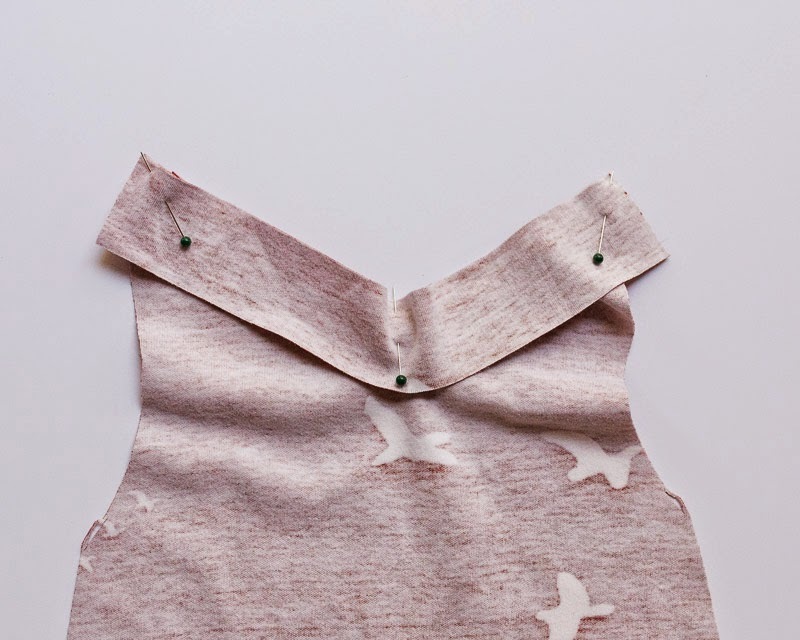 Knit fabrics shrink quite a lot, so don't skip this step! When using Birch interlock knits, I have had significant shrinkage, even after prewashing and drying. I would therefore recommend prewashing and drying a few times to be on the safe side. After you print the pattern, be sure that the 1 inch box on page one measures at 1 inch. Tape the pattern together so the lines at the top and bottom of each page overlap. Trim away the paper above or below the line. Using a double needle is actually very simple. Here's a great tutorial on how to do it. When hemming knits, you can use a narrow zigzag stitch (0.5mm width and 2.5-3.0 in length) or a double needle. I like to increase my stitch length to between 3.2-3.8 when using a straight stitch. I start sewing about 1/4"-1/2" away from the fabric edge and then backstitch to the edge, otherwise I find that my machine eats my knit fabric, pulling it down into the needle plate. 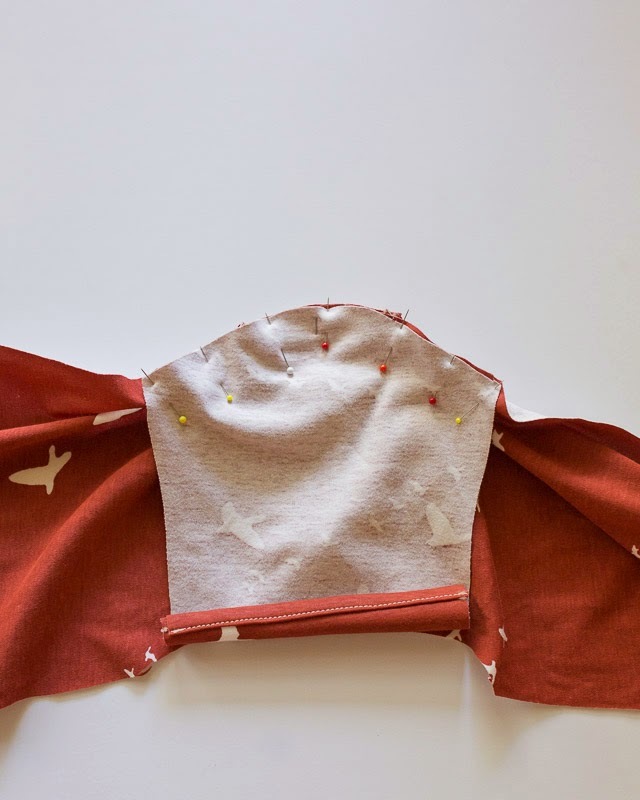 First, start by sewing on all of the bindings, both to the front and back necklines and the sleeves (if you are using the bindings on the sleeves). If you plan to hem the sleeves, you'll do that at the end. Pin the right side of the binding strip to the wrong side of fabric, once at each end and once in the middle. Add additional pins as needed. Then sew with a 1/4" seam allowance. Press the binding strip up. Turn to the right side and fold the raw edge by 3/8". Press. Fold the pressed edge over, covering your stitching line. Edgestitch. Place the back gown piece on top of the front gown piece, overlapping the two pieces between the lines you marked, as indicated on the pattern pieces. Pin and then baste. Fold the gown onto itself to find the center point at the shoulder. Mark this point. Match the center point of your sleeve to the center point on the shoulder. If you forgot to mark the center point, just fold the sleeve in half to find it. Pin, right sides together, at the center and the two ends first. Then add more pins as needed. Sew on the sleeve. Repeat with the other sleeve. Then sew the seam in one fell swoop, from the sleeve edge all the way down to the bottom edge. I use a stretch stitch for this step. A narrow zigzag stitch (.5 mm in width and 2.5-3.0 in length is often suggested) would work, too. If your seam gets wavy at this step (or ever) just press it well with an iron and that should take care of it! Press the bottom edge of the gown up 1" to form a hem casing. Since knits do not fray, I choose not to finish my raw edge. The double needle (or zigzag stitch) gives it a finished look. Stitch using a straight stitch with a double needle, a stretch stitch or a zig zag stitch, with a 6/8" seam allowance. Leave 1-2" open to insert the elastic. I found my hem broke once when sewn with a double needle, but not when sewn with a zigzag stitch. When sewing the hem with a zigzag stitch, I stretched the fabric slightly as I went. Given the hem casing is gathered by elastic, I felt the zigzag stitch still resulted in a nice finish. I would recommend using a zigzag stitch. Thread your 16" piece of elastic through the casing. Stitch the short ends of the elastic together securely, making sure the elastic is not twisted. Then stitch the opening on the hem casing closed. If you chose to hem your sleeves, do so now. Press the sleeve edges to the wrong side by 1/2". Then hem them using a 3/8" seam allowance and a narrow zigzag stitch. And there you have it : your finished newborn gown! 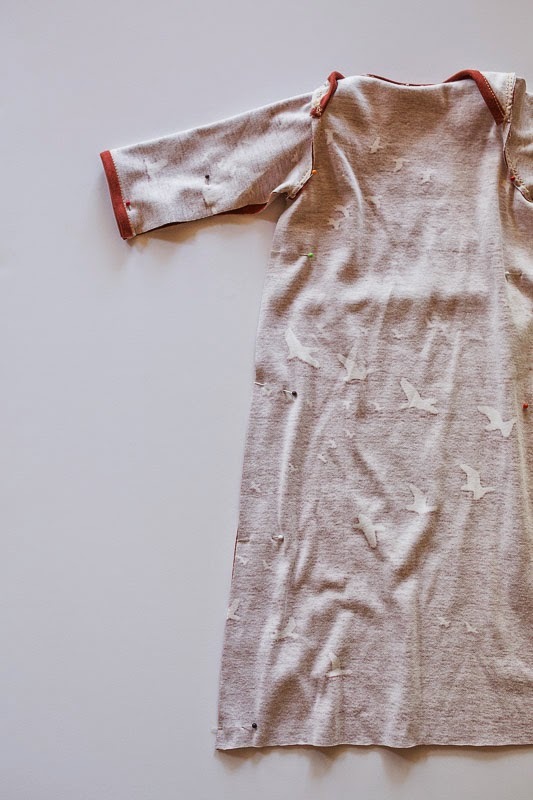 I would love to sew this newborn gown, and not only because nobody knows it in France. But after a try the past week end I can tell you I won't : knit is evil to me, I almost broke my sewing machine, tears were not so far and the result is an awful dress (and it's for a tour so I have to sew nother one !). That's really too bad when I see your pattern... No doubt others will sew lots of newborn gowns "Rachel like" ! I'm sorry! I used to struggle with knits, too. I found working with high quality knits to be key. I really like Birch fabrics. 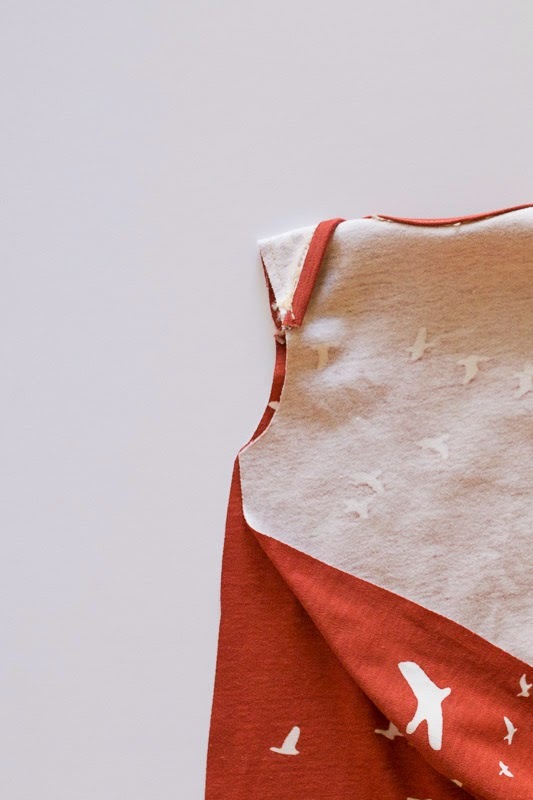 If it's any help to you, Rae from Made by Rae has a great series on sewing with knits here : http://www.made-by-rae.com/knits/ . Thank you Rachel, I'll take a look when my tears will be dry (kidding). hahahaha! That is really funny! I used to have a terrible time sewing knits....until someone told me it was my needle. Ugh....I never knew! If you are like me and didn't know....a brand spanking new needle for knits will make you smile again. I used an Extra Largr men's T Shirt. It was not wiggly which may have added to your frustration. Let me know if I can help you. Wonderful pattern! You've put a lot of effort into it and with a newborn too. Thanks! I love the look of this pattern, thank you. I have 2 new babies coming next year (not me literally) so will give this a try. Yay!! This is big time exciting, Rachel - your first pattern! And so sweet to make it available to the blog world:) What a great looking tutorial -clear pictures and well-written instructions. Thank you for sharing your time and talent! Thank you so much, Lucinda. I always appreciate your support! This is awesome, Rachel - thank you!! Now someone needs to have a baby so I can make one! 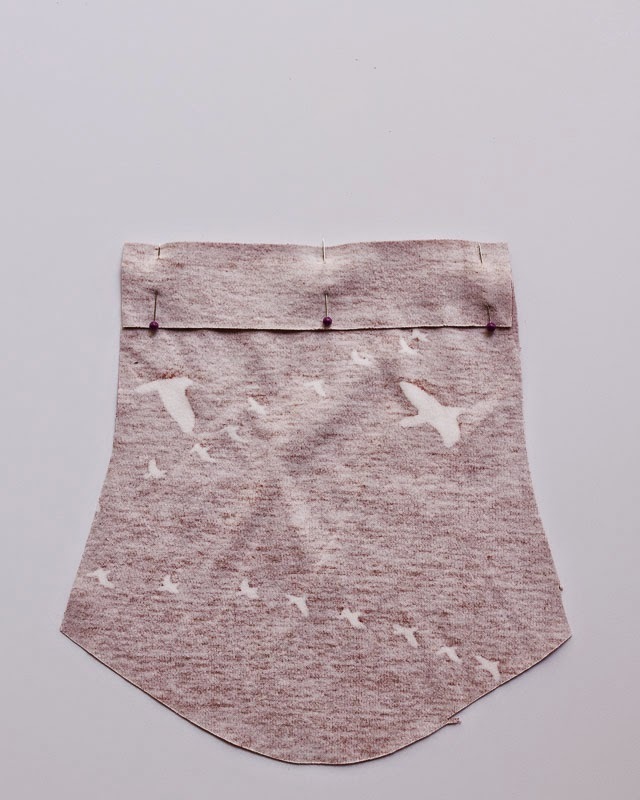 I love love love that Flight knit. Beautiful!! So sweet, Rachel! I'm with Gail - I need a baby to sew this for! I love the knit you've chosen here - just yummy. Since the envelope is pretty wide it's not getting stretched a ton so I'm not surprised straight stitch is working well. Just don't use it on those sleeve hems, right? :) I need to try stretch thread! You did it!!! I am so impressed! The gown looks fantastic (notento self: must find a baby to sew for) and it's so practical. I loved putting my girls in them when they were babies! Wish I had this 6 months ago but I have it now for future babies. Love this pattern! Just made it in a darling Aztec print and can't decide whether to keep it for our baby coming in April or to give it away :). As a fellow homeschooling, sewing mom of a bunch of kids, I love your blog! Thanks for sharing. 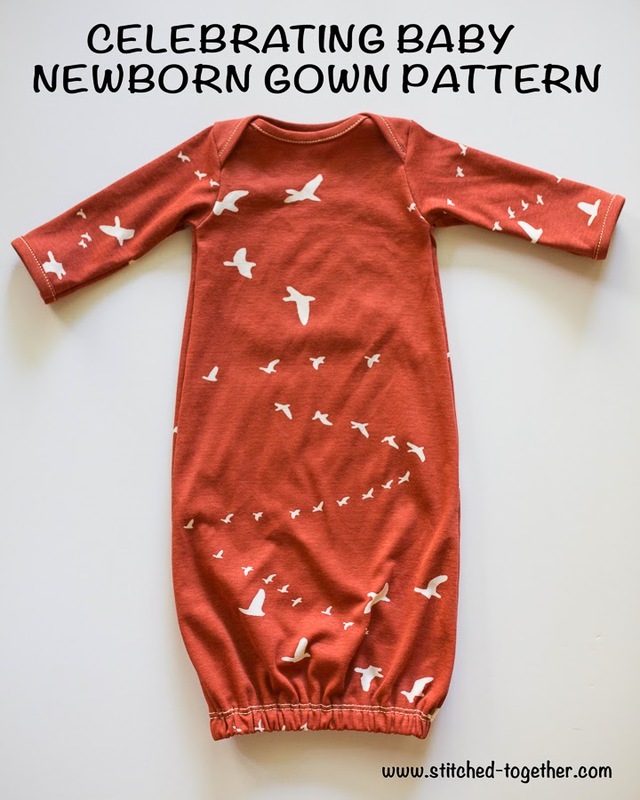 This NB gown pattern is perfect and the tutorial was so easy to follow! Thank you! I was able to sew this up just in time for our baby due in the next month! I am totally in love with the fabric and this pattern! I actually almost have all the ingredients for sewing :) BUT..how practical is this gown for putting it on and taking it off?? It seems like a bit awkward to pull the whole thing from the bottom opening over the head. I would be very thankful for any comments from Mom's who have actually used this on their babies. 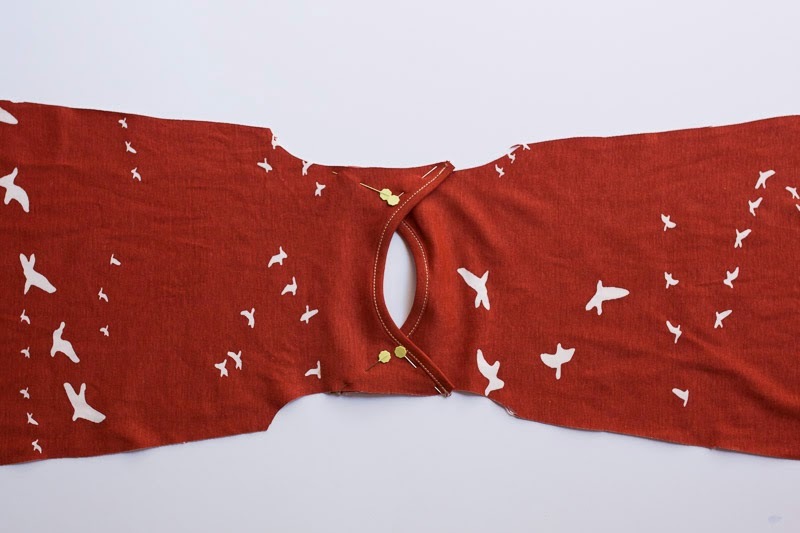 I have not used this because my granddaughter is too small but the overlap shoulders are designed to fold over the shoulder and take off that way! By that I mean to pull down over the body instead of over the head. This tutorial is awesome! I've never sewn with knits but after giving this a try I'm totally hooked! I made three gowns and the. Didn't quite have enough for a fourth so I made it a shirt! Totally adorable! 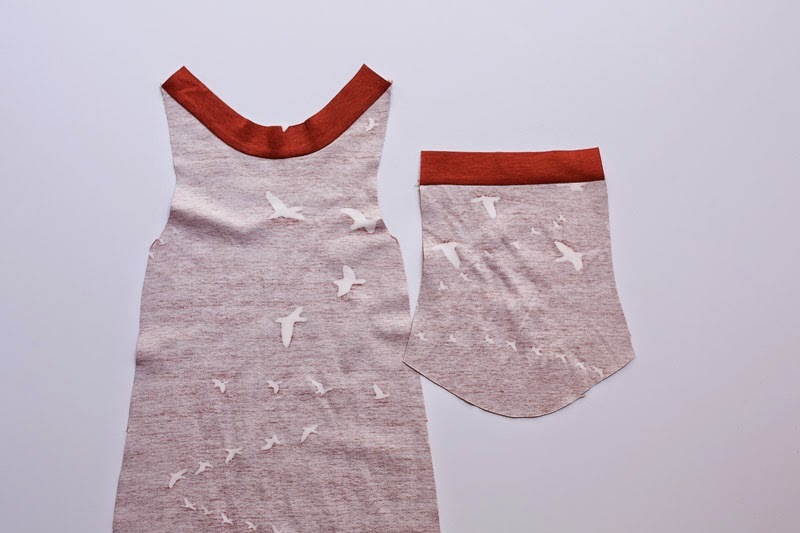 I used birch fabrics acorn trail and Charley Harper prints. Thanks so much for sharing this!!! I would love to sew this gown for my first grand child.... BUT..how practical is this gown for putting it on and taking it off?? It seems like a bit awkward to pull the whole thing from the bottom opening over the head. I would be very thankful for any comments from Mom's who have actually used this on their babies. In the US, newborn gowns are a standard part of a newborn layette. I didn't find them awkward at all - I used them for all four of my biological babies, - and LOVED them which is why I created the pattern. I did read that some moms love them because, if the baby has an explosive poo, you can pull them off over the shoulders and down, instead of up over the baby's head and it makes clean up easier. I cannot attest to that - but it sounds like it would work. Hope that helps! my sister's having a baaaabyyyyyy! guess what I'm making up first? thanks for the pattern! I'm planning on sewing a few of these for my granddaughter (her mom is due in March). My daughter wants to use one for the baby's coming home outfit so I am wondering about fit. Her last baby was full term and just shy of 7 lbs. 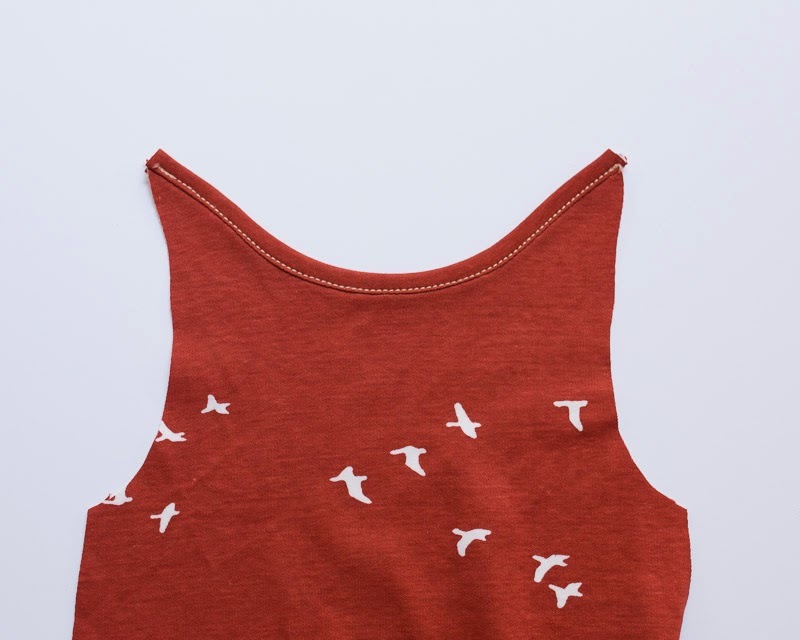 Do you think this would be small enough for a petite little girl? But I was able to keep her in these gowns for a full 3 months, rolling the sleeves at first. It made middle of the night diaper changes a breeze, so I really appreciate them! Thanks Rachel! I think my daughter is mostly concern about it staying on the baby's shoulders:) I'm going to make her a few and a few more for my niece who is having a boy in Dec. 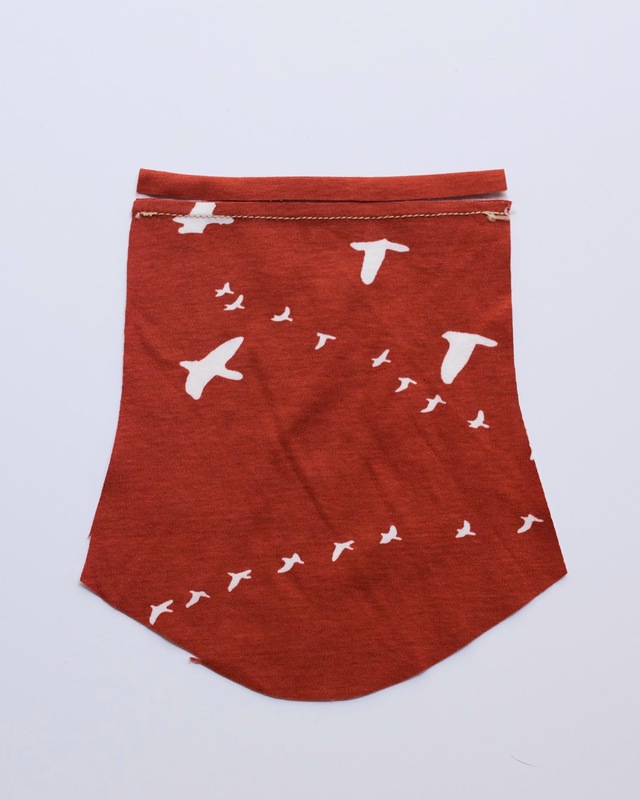 I pre-ordered some sweet fabric from Birch's upcoming line....too adorable! Thanks for the inspiration. I love Birch interlock knits - BUT my only advice would be to wash and dry several times before you sew with them. 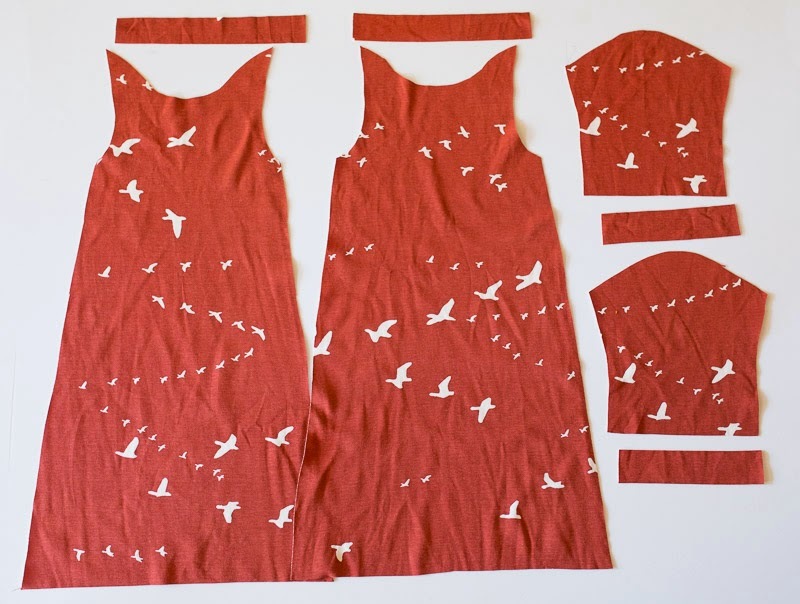 I sewed two dresses for my girls' in Birch interlocks and they shrunk up so much - even though I had pre-washed and dried like I always do. They shrunk several inches! The girls actually wear them as shirts now instead of dresses! The shrinkage was truly remarkable. :/ Love the prints though and they are holding their colors beautifully, whereas some of the other knits I have purchased have faded significantly and also pilled! How did you go with the pattern? I am also planning on making one for my grand child..But I am wondering how practical the gown is for putting on and off the little wee one...what was your experience?? Thank you Rache for the pattern. I've cut it out but not tried making one yet. I AM NEW TO SEWING so is it okay to use flannel as the fabric? What would be used as binding then? Does the stretch needle have a number or does it specifically say "stretch" on the package? Thanks in advance. thank you Rachel. Finally got around to making!! Thanks for the heads up on what material to use. It turned out GREAT !! I had a super pattern that was easy to follow. (wink wink) Got a great nephew who will be my model. (He''s my guinea pig on any/all the baby items I make). Definitely will be making more of these in near future. Again, THANK YOU RACHEL, for the EASY TO FOLLOW INSTRUCTIONS!!! Rachel, this gown is adorable! I was hoping to make one without the elastic that you just knot at the bottom. Have you ever made one like that? I've only seen them on Pinterest and they always show them tied so I'm not sure how they look untied. Yes, I think that would be an easy enough adaption, for sure. I would just tapered the bottom and add quite a lot of length. Then hem and tie. If you look on pinterest for 'newborn gown with knot' you will see lots of example of this! Good luck and I am so glad the tutorial has worked out for you! Thanks! So you think just taper and leave the hem straight or taper down the sides into kind of a point? I have been "googling" and it looks like you can find them with knots but only as items for sale, no tutorial. It looks to me like it is tapered to almost a point, doesn't it? To me, it looks like it's about 1/4 of the width of the chest. I would add a lot of extra length to the gown pattern, tie it below where the elastic would normally be. Once you know how long it should be, you can taper the fabric and cut away the excess fabric in length as well. Does that make sense? I love this!! Great instructions too! I'd love for you to come over and submit this tutorial to DIY Crush! Thank you so much! I can't wait to give this a sew! How hard would it be to make the pattern larger. My niece loves them and her baby is 7 months. For some reason the link to the PDF is not working for me. Any tips? I'm really sorry you're experiencing that problem, Courtney. It works here, from my phone, and from my husband's office. My husband wondered if maybe it was a browser compatibility issue? He suggested you try opening it in Google Chrome. I hope that works. Thank you for the pattern - it was the first knit project that I made for our little baby (and a bunch of friends' babies, too). It have me the courage to just go out and try it! Unfortunately, the didn't quite work out for us - both my husband and I had trouble actually putting them on the baby and by the time it was on she was usually quite upset :( There was just too much fabric that we had to pull over her head and shoulders. I reworked out two gowns and now they work great sleepers (I just cut the elastic/tunnel, cut out half ellipsoid and finished the seams with jersey bias and snaps and sewed cuffs to the bottom). Hi Amelie! I'm so sorry it didn't work out for you! I know how frustrating it is to put the time and money into a sewing project and have it not work out. 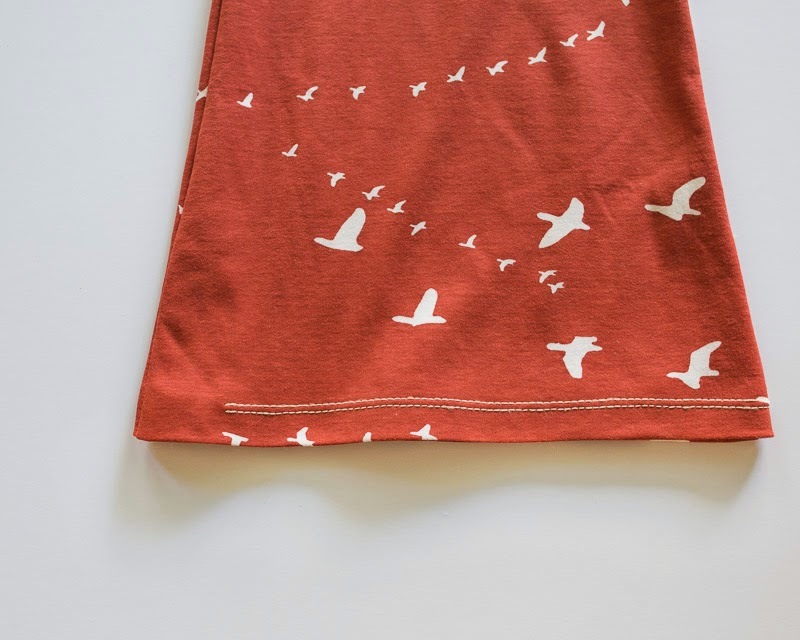 I've used this pattern for my own newborn, have given it away, and have had others make it and you are the first to report this as an issue. I have heard that some people pull the gown on from the bottom up. I actually made this pattern because of the gown's ease of use. My babies would cry over snaps. It just took too long for their liking! :) Anyway, I am glad you found a solution that works for you! All the best to you! Tried it and loved it. Thank you so much. wish I could post a picture. Just finished a blue gown from an XL men's T Shirt. It is just what I wanted, so soft and snugly! Baby boy was born this morning to my across-the-street friend, Laura! She chose not to know the gender, so I had to wait until she told me to start the gown. Had a pink and a blue ready for this project. Cut the front of the gown pattern out of center front of the T Shirt, the back out of the center back and the sleeves from the bottom sides. Cutting all pieces using the existing hems from the bottom of the T Shirt meant NO gown or sleeve hemming! Cut the neck bindings from the top back of the T Shirt. I cut two pieces of elastic, 8 1/2" each and put one through each side of the gown hem, pinned and stitched them in when I sewed up the sides. Total time from cut to finish: 2 1/2 hours. Sleeves of the T Shirt is about all that is left, enough to make mittens and use the sleeve hems for the mitten hems. Had all the supplies, so the cost is $00.00, you can't beat that! 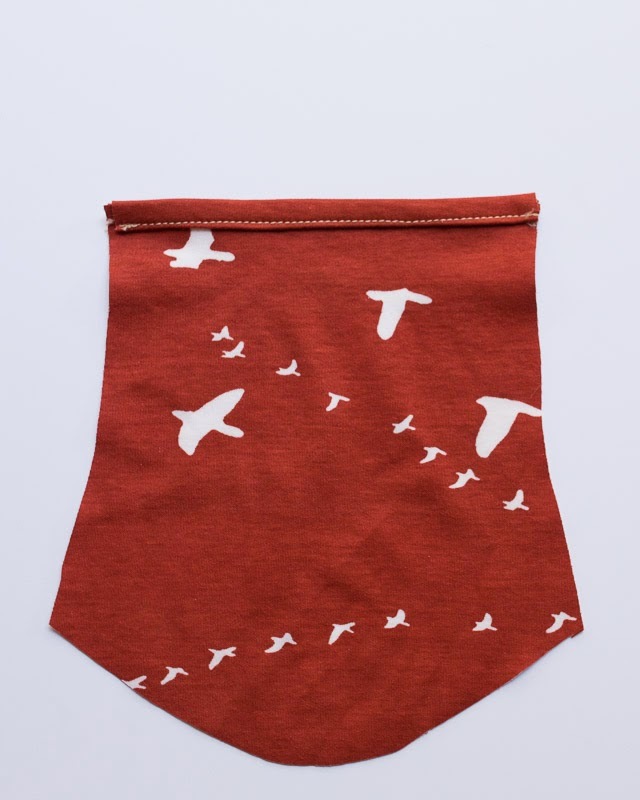 I also made a dozen burp cloths, bibs, hats and mittens for Laura' baby mostly from T Shirts in gender neutral colors and patterns, using lots of fabric remnants I already had and 1 yard of fabric. Total cost was $4.00 for fabric and $9.00 for the next-to-the-largest size snaps at Joann's Fabrics. Congratulations on an awesome newborn gown pattern and a huge thank you! This will be my Go-To baby gift pattern. Molly!! I would love to see your finished baby gown !! Could you post a few pics??? Do you happen to have this in a larger size? LIke a 3-6 month? I'm sorry - I do not. Thank you for a wonderful pattern . I made this for a gift to my niece for her son who is a week old. It all went together beautifully. I can see more being made for gifts. Hi! I was wondering if this pattern could be used to make gowns to sell - or if it is only for personal use. Thanks! Hi, this newborn gown looks amazing! I would like to sew one for my little baby but can't find the pattern on the website? If you scroll down to the "You'll Need" section near the top of the post, you'll see the words "the PDF pattern HERE". The word "here" links to the PDF pattern. :) Happy sewing! Hi, wonderful tutorial, but where do I find the printable pattern? If you scroll down to the "You'll Need" section near the top of the page, you'll see the words "the PDF pattern HERE". The word "here" links to the PDF pattern. :) Happy sewing! Thanks for sharing Rachael, I made one out of a 2XXL t-shirt and added flip over mittens on the sleeves (that took a bit of working out). It works really well, just what I wanted and I can't wait to use it on baby due in 3 weeks. I might make a few more to pass the time LOL. What if you want to do a foldover sleeve for anti scratch? How would you go about doing this? I haven't tried it though - it was the top hit on Google. I have a newborn right now and the sleeves are long enough that her little hands stay inside the sleeves, so I don't think mittens are absolutely necessary. But it's up to you! I'm planning on sewing a gown for my nephew who will be here soon! I'm just now cutting out the pattern and I'm a little confused with how to piece it together..... It looks like I only have half of the front and half of the back.... Am I supposed to print out doubles and then mirror the pieces so that I have a full front side and full back side to cut out? You would fold your fabric in half and place each piece on the fold along the arrow. :) Happy sewing! How do you keep your knit fabric from rolling in on itself? I’m fairly new to working with knit and haven’t had any luck with it! Some knits roll more than others, but I think the rolling tends to be part of working with knit fabrics. I try to press it well, add fine/thin pins and sometimes adding a bit of starch spray helps. Good luck!